The following module was designed to supplement medical students’ learning in the clinic. Please take the time to read through each section by clicking the headings below. Information on superior vena cava (SVC) syndrome is provided. Superior vena cava (SVC) syndrome refers to the impediment of blood flow through the SVC caused by thrombosis, invasion, or compression by pathology involving nearby anatomical structures (ex. lymph nodes, right upper lobe of the lung, etc) . SVC obstruction is considered a medical emergency that requires rapid assessment and management [2,3]. This module reviews the relevant anatomy, pathophysiology, etiology, clinical features, diagnostic approach, and management of SVC syndrome in patients with malignancy. 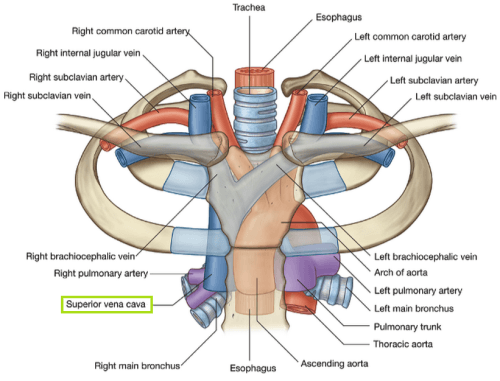 The superior vena cava (SVC) (Figure 1) is a vertically oriented vessel located in the superior mediastinum that extends from the confluence of the right and left brachiocephalic veins to the right atrium [3,4]. The SVC acts as a conduit that drains venous blood from the head, neck, upper extremities, and upper thorax into the right atrium . Located in the mediastinum are other tributary veins of the SVC that play an important role in the pathophysiology underlying the development of SVC syndrome. 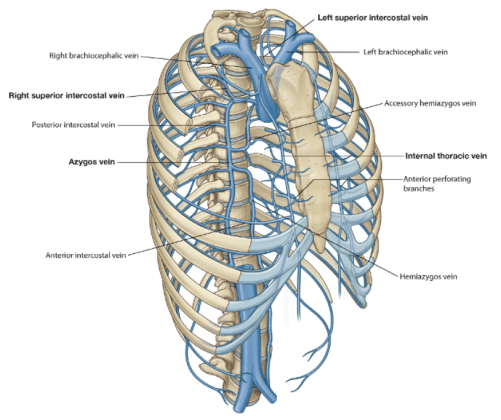 These include (Figure 2): the azygos, internal mammary, lateral thoracic, paraspinous, and esophageal veins . An obstructed SVC triggers the formation of venous collaterals as alternate routes for returning venous blood flow . 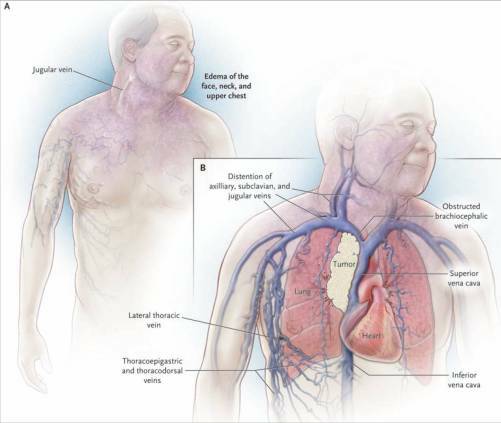 Collateral veins may be derived from SVC tributaries (see “Anatomy Review”) . The edema resulting from SVC obstruction often has minimal clinical consequence, although it can lead to the narrowing of nasopharyngeal passages and potentially cause stridor, dyspnea, hoarseness, cough, and dysphagia . Cerebral edema is an extremely rare complication that can also occur due to SVC obstruction, with serious consequences including cerebral ischemia, herniation, and death . Acute SVC obstruction may give rise to temporary drops in cardiac output that is usually rapidly restored by collateral flow and elevated venous pressure . Hemodynamic disturbances are more likely due to mass effect on the heart rather than directly from the SVC obstruction . The majority (60-85%) of superior vena cava (SVC) obstructions are due to malignant processes involving intrathoracic structures [1,3]. However, as the incidence of thrombosis induced SVC syndrome is rising due to the increased usage of intravascular devices, benign causes are now responsible for 15-40% of SVC obstructions [1,2,3]. Superior vena cava (SVC) syndrome can often be diagnosed clinically in patients with overt presentations [1,3]. The following section will outline the appropriate clinical approach to investigating a patient with suspected SVC syndrome. SVC syndrome can often be diagnosed clinically in patients with overt presentations [1,3]. However, patients with minor signs and symptoms that are suggestive of SVC obstruction require further diagnostic imaging [1,3]. The following section will focus on the management of superior vena cava (SVC) syndrome in patients with underlying malignancy. The main goals of therapy for malignancy related SVC syndrome are to relieve symptoms and to treat the primary malignancy [1,3]. Short-term high-dose corticosteroid therapy is indicated in steroid-responsive malignancies and patients with laryngeal edema. The practicality of radiotherapy (RT) has been debated based on recent studies which assert that the majority of symptom relief is reliant on the formation of venous collaterals rather than RT. Diuretics may also be administered although the clinical evidence for improvement is equivalent to corticosteroid therapy alone or in combination with diuretics. The patient prognosis of malignancy related superior vena cava (SVC) syndrome is highly variable depending on the primary malignancy implicated . In general, the average life expectancy is approximately six months . This case study was designed to supplement your knowledge on the workup of SVC Syndrome and test what you have learned after going through module. Use your mouse to click through the slides and answer each question in the text box provided. Drews RE, Rabkin DJ. 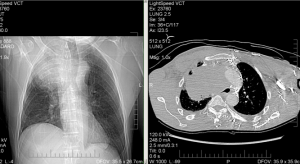 Malignancy-related superior vena cava syndrome. In: UpToDate, Post TW (Ed), UpToDate, Waltham, MA. (Accessed on July 21, 2014). Ingledew P. Oncology emergencies for medical students, PowerPoint presentation, FVCC, Surrey. Drake RL, Vogl W, Michell AW. Gray’s Anatomy for Students 2nd Edition. Elsevier Inc.; 2009.